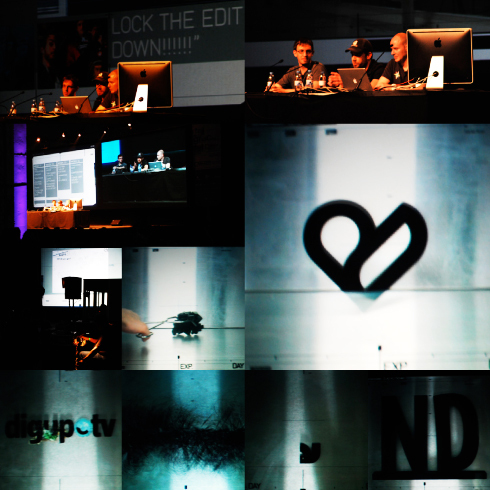 The design legend was fist on at OFFF 09. 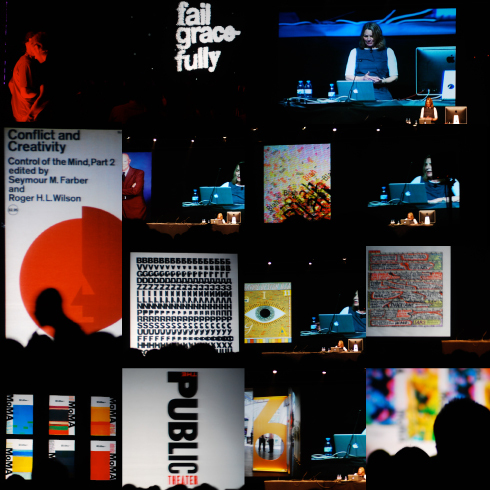 He talked about dangerous design, telling us to “make trouble” and “take risks”. Neville Showed past work and took us through the redesign of the Times Newspaper. However did reminded me slightly of a history of a design lecture at college. 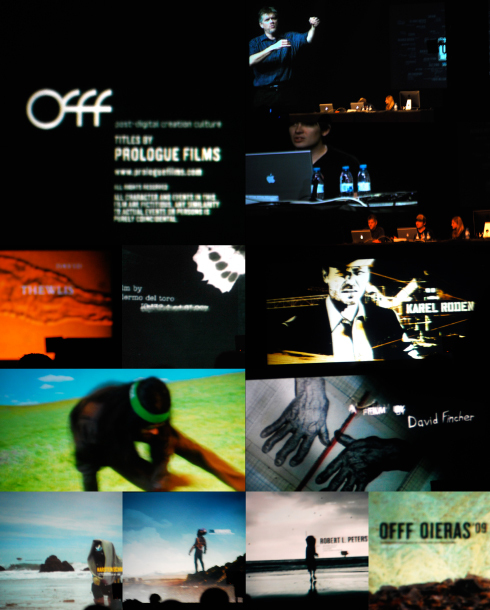 I had been looking forward to seeing Karsten at OFFF. I have been following his work for a while now. His presentation met my expectations, presenting an outstanding range of work, from his involvement with universal everything to work for Audi & Nokia. 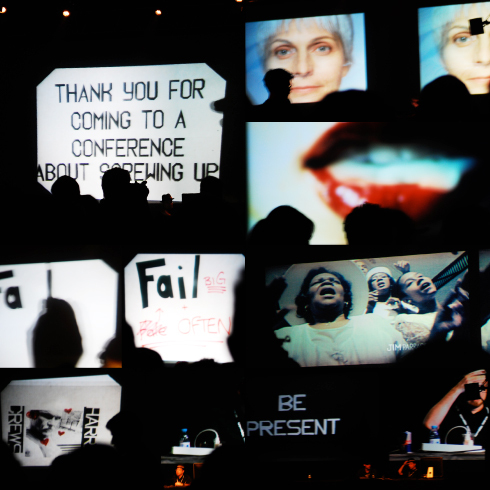 U.V.A showed us an impressive array of audio generated visuals for Massive Attack & The Chemical Brothers. An installation for V&A and some impressive interactive work. A brief introduction to the thought process behind the OFFF Sponsors credits, then 8 mins of 36 crazy logo animations cooked up in a Lab! Great stuff from OneSize. 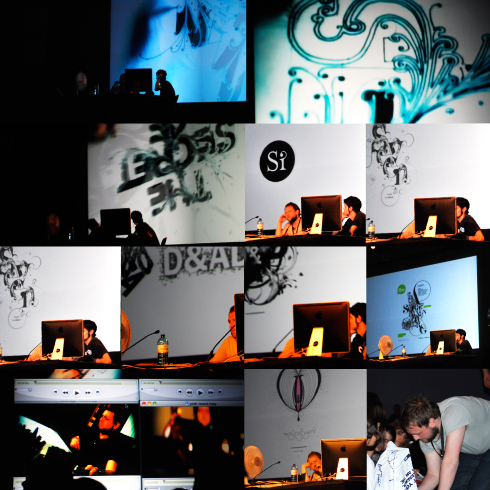 PES provided the OFFF crowd with jaw dropping stop motion graphics. Showing a human surfboard and animated coins and socks! How you even make objects do those crazy moves is beyond me! Paula Scher’s career to date has been outstanding. Paula talked us through a huge volume and range of work from her career. With a more traditional approach to design and some fantastic typography work. 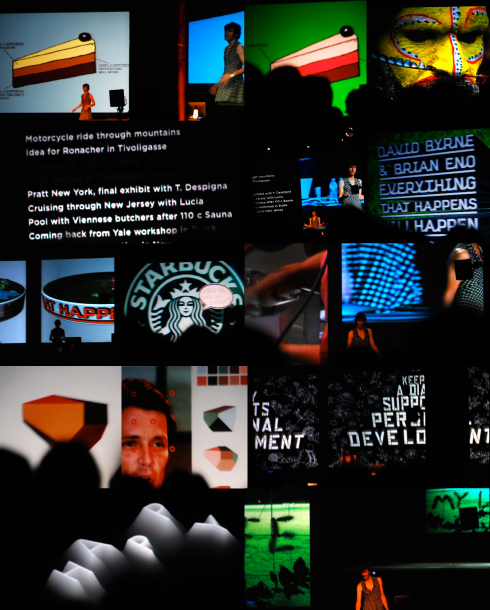 One of the highlights for me from OFFF 09. Having seen Joshua Davis at MadInSpain last year I knew what to expect from Joshua, however he impressed me with the way his work is progressing in new directions. Joshua rocks a crowd like no one else and certainly got a big reaction to his interaction with the crowd. 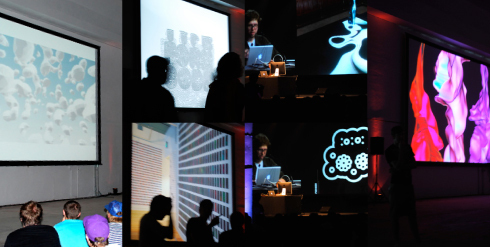 I was impressed with his collaboration with Float 4 to produce the Interactive Wall at OFFF, combining his abstractions with new technology. After spending a bit of time hanging with Si in Lisbon I was looking forward to seeing him speak. Si did Leeds proud and overcame sound problems delivering a fresh and inspirational talk. Si speaks from the heart and showed the audience through his impressive range of work. From college work & winning a D&AD young blood award through to current work for clients such as Madonna and Sellfridges. I think Si shocked the crowd by telling them 90% of his work is done by hand. Digital Kitchen delivered a well put together presentation taking us through the creation of their True Blood title sequence. I would have liked to have seen a wider range of projects but their presentation style and slides more than made up for this. After coming on stage in a rather fetching spotted dress I was unsure what to expect from Stefan Sagmeister. He spoke about a list of things that make him happy and how much that is influenced by design. An impressive volume of conceptual work was shown, from the album covers he is renowned for through to crazy installations. 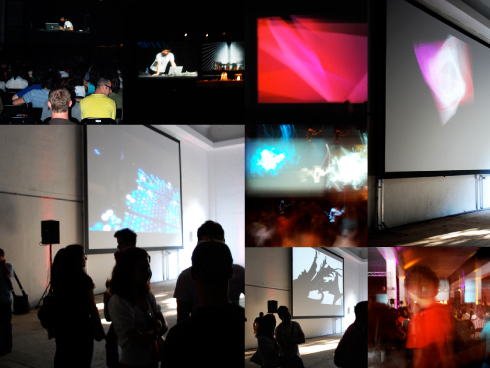 Highlights of work for me were the Being not Truthful installation and the identity for Casa de Musica in Portugal. 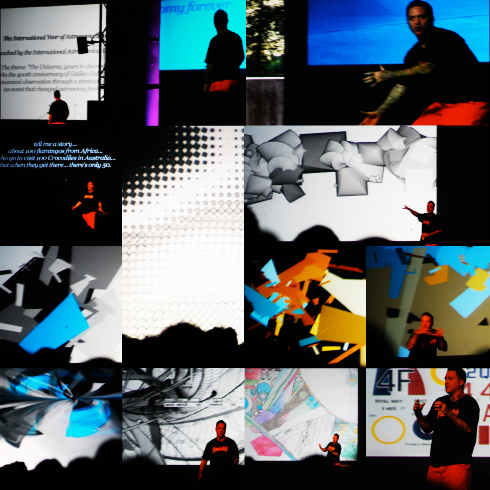 Stefan had some important messages mainly to be self confident and find happiness in your design process. The rest of my photos will be on my flickr very soon! 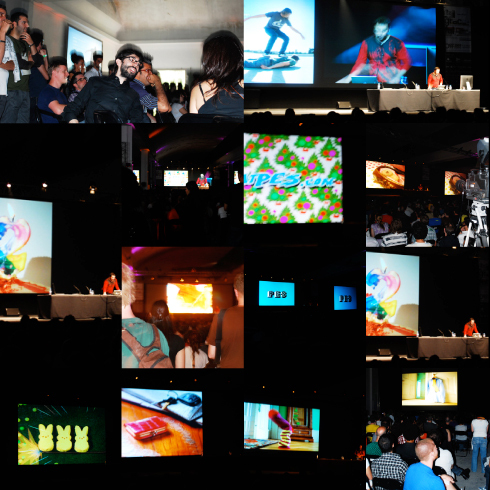 #Joshua Davis #KARSTEN SCHMIDT #Lisbon #Neville Brody #OFFF 09 #OneSize #Paula Scher #PES #Photo Report #Si Scott Studio #U.V.A.